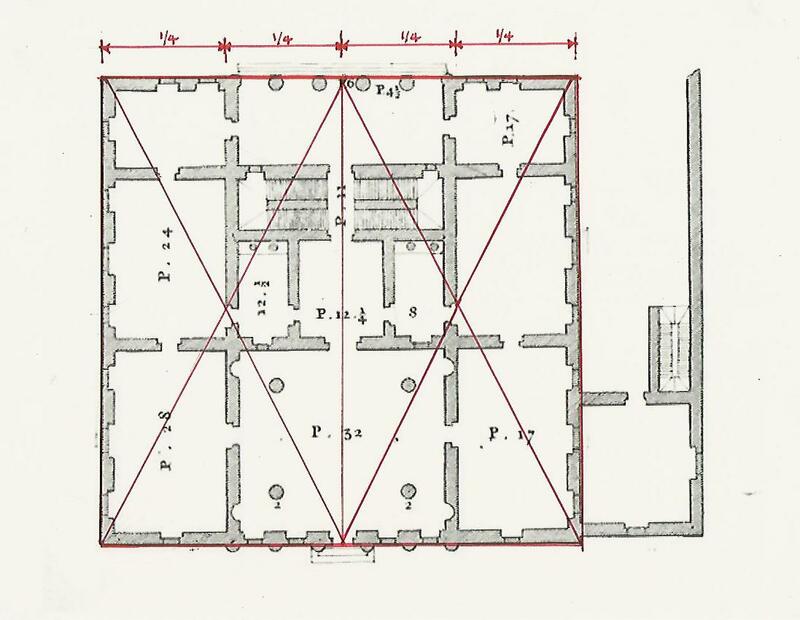 This is part of Plate 1, The Second Book of Andrea Palladio's ARCHITECTURE. 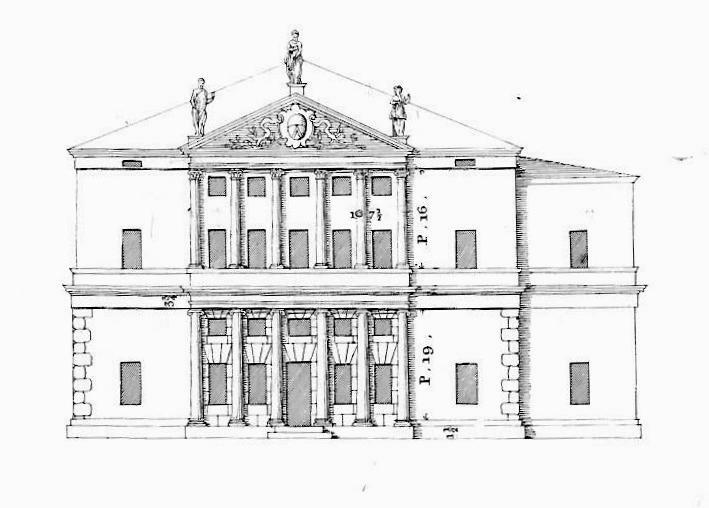 Palladio's 4 books of Architecture were published in`1570 in Venice. They were meant for Italians. He wrote in terms of the local climate, and materials he used in and around Venice. He also shares ways of working that today we would agree are 'best practice". that timber should be felled in autumn or winter, "in the wane of the moon". This may be because of the gravitational pull of the full moon on sap. 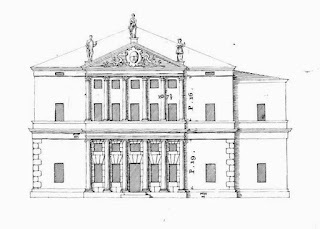 Palladio adds that the timber must be "laid in a proper place,.. shelter'd from the south sun, high winds, and rain." This final sentence would delight all modern contractors: "Those therefore who are about to build, ought to be inform'd from men thoroughly acquainted with the nature of timber, that they may know which is fit for such and such uses, and which not." Many Northern Europeans traveled to Italy as part of their education. The 4 Books were admired and translated. Inigo Jones, English Master Builder, brought his own copy back when he returned from Italy in 1614. He marked it up. He used it. Today his copy is kept at Worcester College, Oxford. The first Book is about construction and materials and the all important Roman columns; the second Book discusses houses; the third Book reviews public places and spaces; the fourth Book concludes with Roman temples. Note: the word 'fabric" means something fabricated, constructed, a building. "Beauty will result from the form and correspondence of the whole, with respect to the several parts, of the parts with regard to each other, and of these again to the whole; that the structure may appear an entire and complete body, wherein each member agrees with the other, and all necessary to compose what you intend to form." This is what we called Practical Geometry 200 years later. 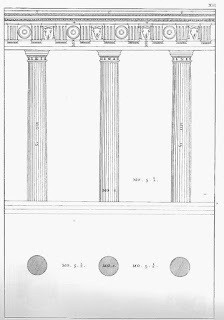 Book I has beautiful drawings of the five orders - the proper proportions and ornaments for columns. 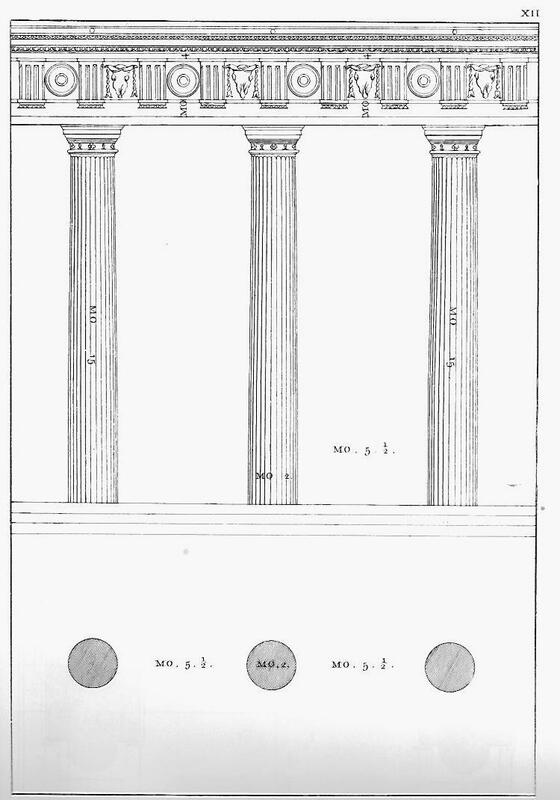 "... in the dividing and measuring of the said orders, I would not make use of any certain or determinate measure particular to any city, as a cubit, foot, or palm knowing that these several members differ as much as the cities and countries; but imitating Vitruvius, who divides the Dorick order with a measure taken from the thickness or diameter of the columns, common to all, and by him called a module. I shall therefore make use of the same measure in all the orders." Note that he has given dimensions: the column width is 2 modules ( MO.2). the space between the columns is MO. 5 .1/2. tThe height of the columns is MO. 15. Palladio includes half of his 'Venetian foot' in his 4 Books. explaining that he divides his whole foot into 12 inches and then each inch into 4 minutes. He notes that the numbers on his fabrics are dimensions based on this particular foot. 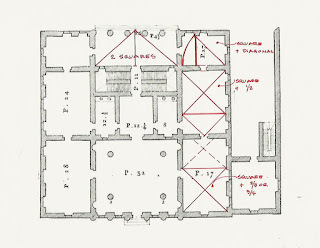 The most beautiful and proportionable manners of rooms, and which succeed best, are seven, because they are either made round (tho' but seldom) or square, or their length will be the diagonal of the square, or of a square and a third, or of one square and a half, or of 1 square and two thirds, or of 2 squares. Here are the diagram for the floor plan house above based on Palladio's list of beautiful proportions. I have copied from the book. It is not quite square. Therefore my analysis is general. 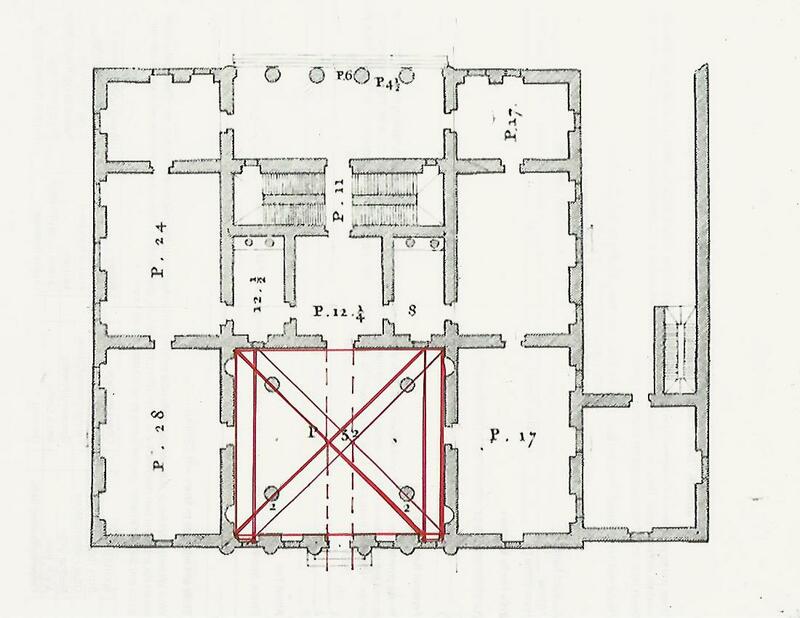 I have used the division of the square into halves and quarters, and the division of the square into thirds, both ways of lay out that could have been drawn on a board or on plaster and laid out with a rope. The plan is a square. The square divided into 4 equal rectangles marks the position of the interior walls from top to bottom. They are thicker than the other interior walls, so probably structural. The line established is on the outside of the walls which would be appropriate for building a wall which would sit on a foundation and support the building. 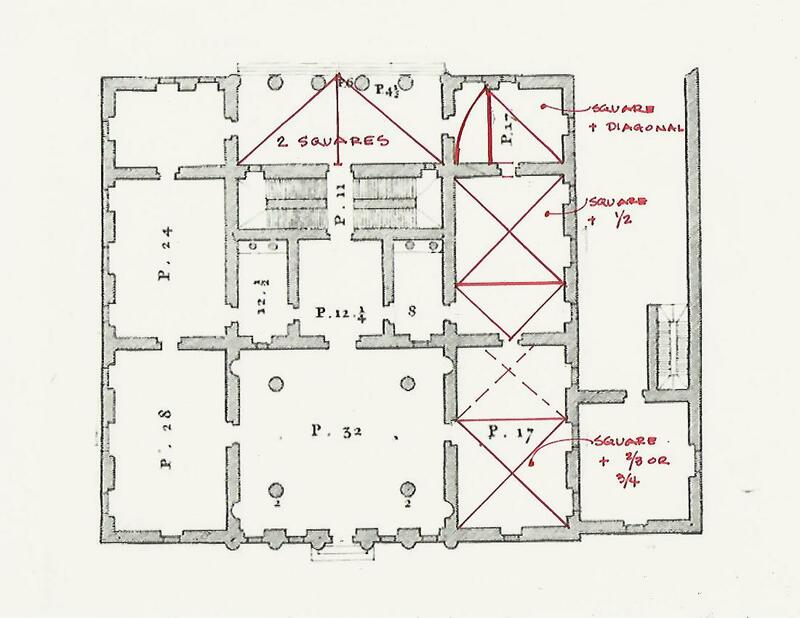 Palladio may be showing off what a good designer he is, but his drawings are also construction drawings meant to convey to his workmen where to build the walls and the columns. When the diagonals of the square are added, corner to corner, the interior walls (left to right) at the edge of the stairs are determined. 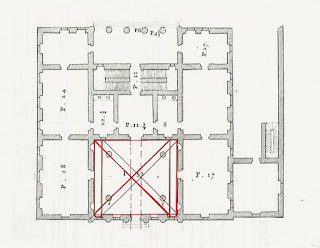 The placement of the columns in the grand hall are also noted. Both points divide the square into thirds. The loggia is 2 squares - one of Palladio's 7 favorite room shapes. The side rooms are also his "beautiful proportions". Upper right: the square with its width the diagonal of the square. Middle right: the square and a half. Lower right: a square and two thirds. The upper columns' location comes from the lines. 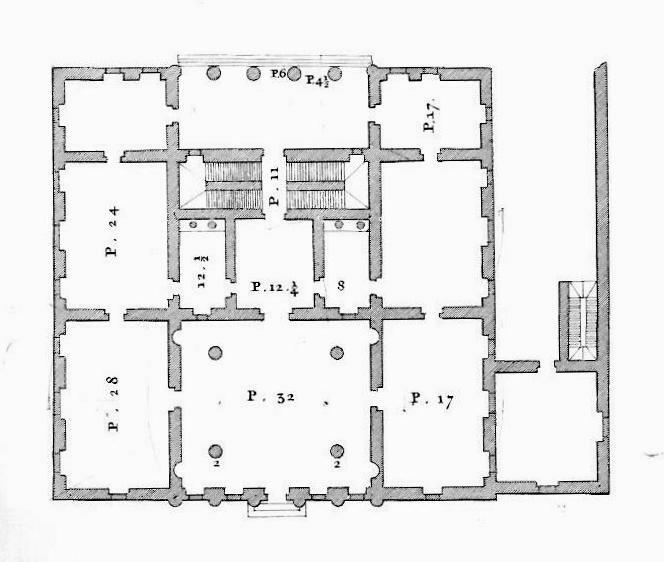 They are at one of the thirds of the square floor plan. 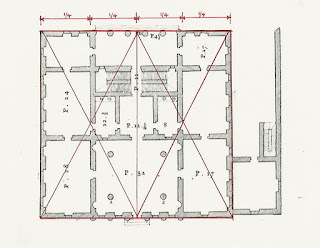 The lower columns are then placed the same distance from the wall for symmetry. The diagonals on each side position the columns more directly. 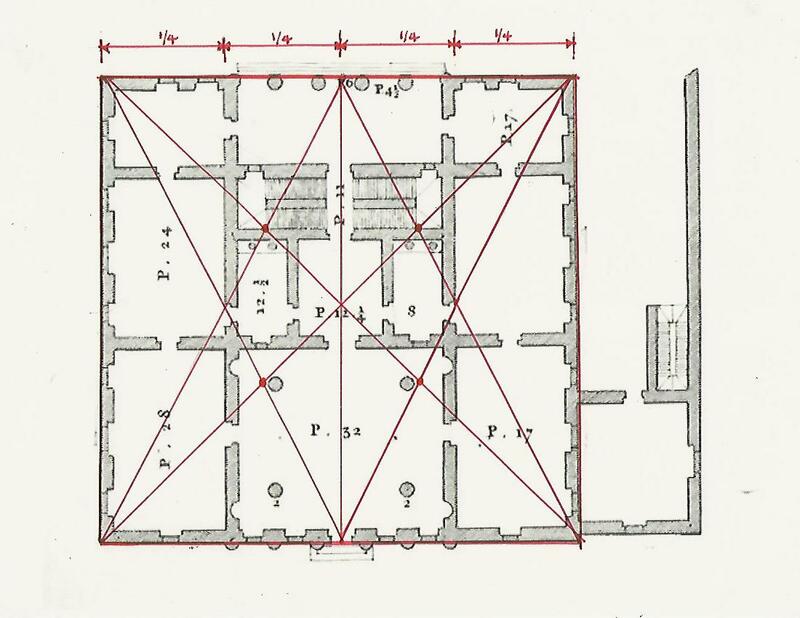 The squares overlap - not in a proportion that Palladio admired. However the overlap is the width of the doors which run from one end of the house to the other. * fabric is an archaic word for a building, My copy of Palladio was translated into English around 1738. Andrea Palladio, The Four Books of Architecture, published by Isaac Ware, London, 1738, reprinted by Dover Publications, Inc. NY, 1965. I will add the practical geometry of the facade next.